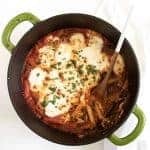 The best cheesy One Pot Baked Ziti recipe with sausage and spinach; everything, including the noodles are cooked in one pot and then finished in the oven. Few things are more delicious than a big bowl of warm cheesy pasta. Throw in spinach and a little sausage and you really have my attention. 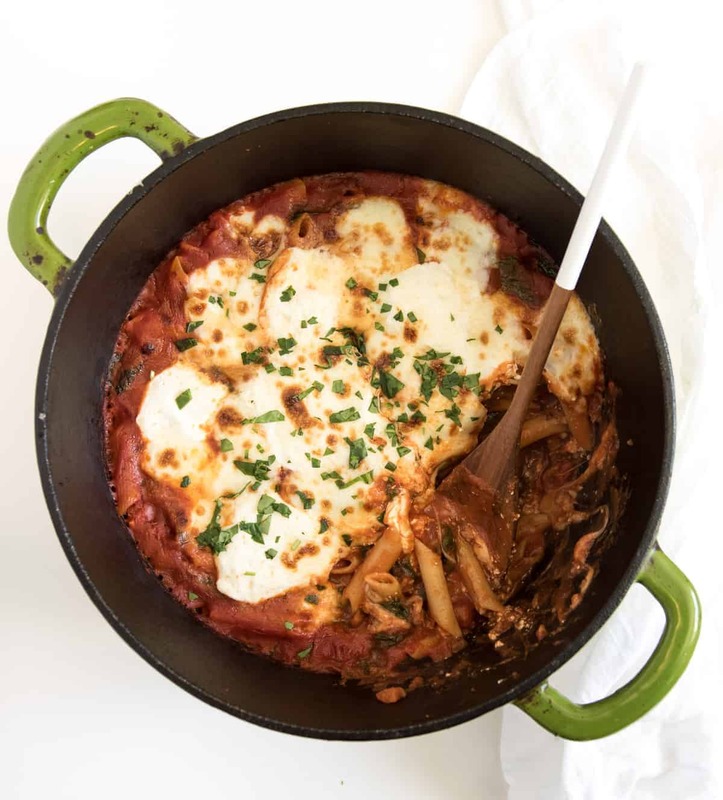 This one pot baked ziti recipe is one of my all-time favorite simple family-friendly meals and I have been so excited to share it with you. This recipe is great because it truly only takes one pot to make the whole meal. You start by cooking the sausage and garlic and then add your tomatoes and let it simmer to create a killer sauce. Then you add water and your pasta and cook the pasta right in the sauce. Add your cheese and broil to bubbly pasta perfection. Did I mention you only need to dirty one pot?! I’m telling you, this is the way to cook. 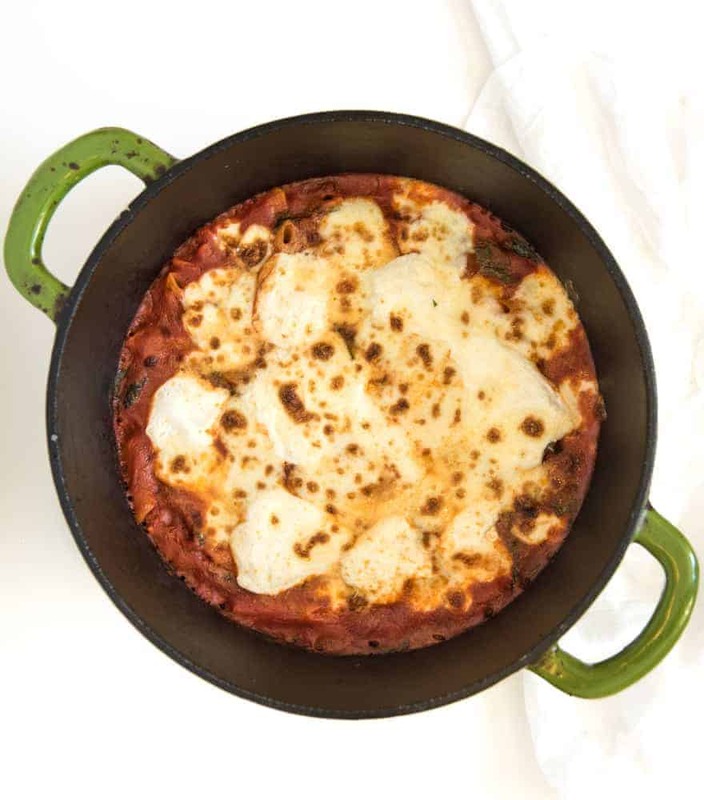 There’s actually a lot of spinach in this one pot baked ziti dish, which I loved. It’s rich and hearty, but full of vegetables too. Make this recipe and you’ll be winning at life. 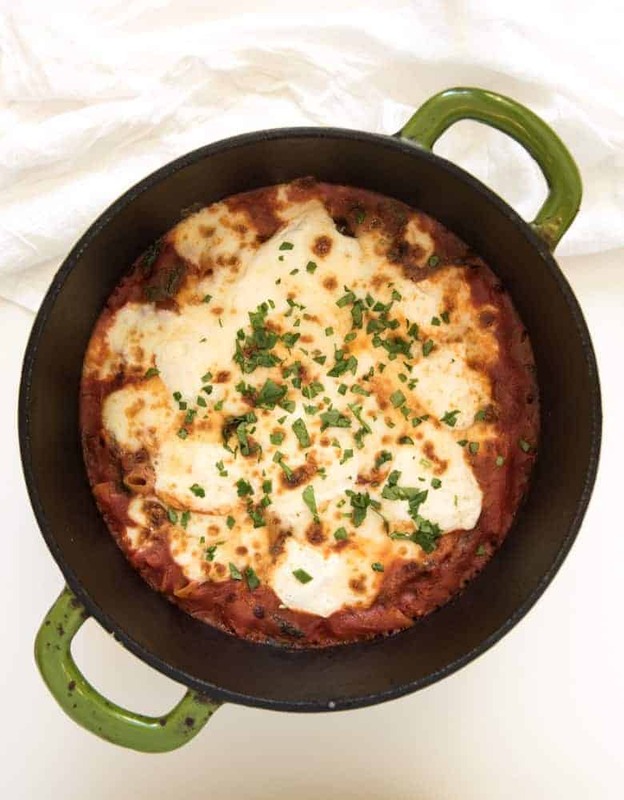 This recipe comes from Cook’s Country One-Pan Wonders cookbook (Cook’s Country is a sister company with America’s Test Kitchen), and I’m excited to review the book with you today. Oh man, there is so much to love! When I got an email announcing this book, I was super excited. 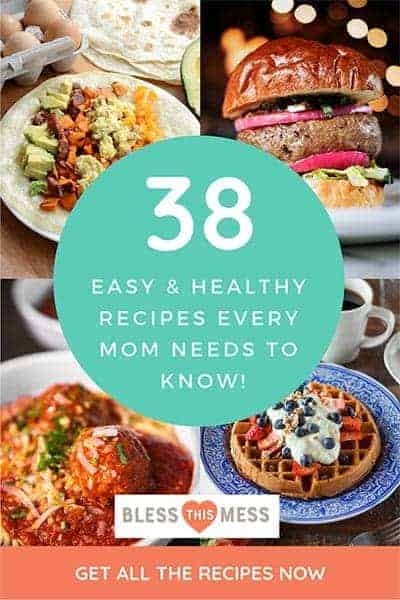 Easy delicious family-friendly meals are what I’m all about, and this book is a powerhouse of knowledge. One-Pan Wonders is divided up by the type of pan that you use to cook the meal – sheet pan, Dutch oven, skillet, roasting pan, casserole, and slow cooker. I thought this was a super practical/fun/useful way to divide up the sections of the book. It makes a lot of food, so plan on leftovers or having it when you have company; it’s definitely company worthy. My kids did not like the whole cooked spinach leaves. Next time I’m going to give the spinach a rough chop before adding it to the pot. That way the pieces will be easier to eat and harder for the kids to notice/pick out. Full-fat cheese really makes this extra ooey-gooey rich and hearty. I highly recommend seeking it out. I just got my mom this gorgeous Lodge dutch oven (color called Lagoon) for Christmas and she loves it. I recommend it if you don’t have one yet. For under $60 it is a steal, and makes a gorgeous gift. I did not try this recipe with gluten-free or whole wheat pasta. I think that the amount of liquid need and cooking times will vary a lot if you use either of those. I recommend traditional pasta for this recipe. Penne pasta is a good substitute for ziti pasta if your little store doesn’t carry ziti #smalltownlife . If you would like this to be a meatless meal, sub the sausage for a pound of sliced mushrooms (and add about a tablespoon of olive oil when cooking). This is great served with a side of crusty no knead bread or some super easy bread sticks. I also love this berry salad or any salad with homemade dressing! Now let’s get to that One Pot Baked Ziti recipe! I hope you make this as soon as you have room in your meal plan. Isn’t that cheese perfection?! Long live bubbly broiled cheese! 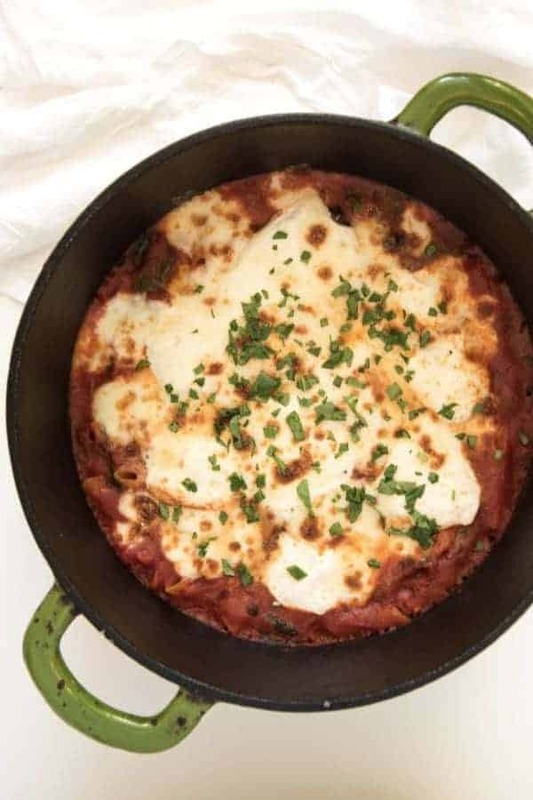 I can’t wait for you to make this One Pot Baked Ziti recipe because you are going to love it. In a large Dutch oven over medium-high heat, cook the sausage, breaking the meat into 1/2-inch pieces, until lightly browned, about 5 minutes. Stir in the garlic and cook until fragrant, about 30 seconds. Add the tomato sauce, diced tomato (with the juice), oregano, salt, sugar, and pepper flakes. Bring the mixture to a boil. Reduce the heat to medium-low and simmer until slightly thickened, about 10 minutes. Stir in the water, pasta, 1/4 cup basil, and increase the heat to high, and bring to a boil. Reduce heat to medium and simmer vigorously, stirring often, until the pasta is still very firm but starting to soften, 6 to 8 minutes. Meanwhile, adjust the oven rack 8 inches from the broiler element and heat the broiler. Remove the pasta from the heat and stir in the spinach, 3/4 cup mozzarella, and 1/2 cup of Parmesan. 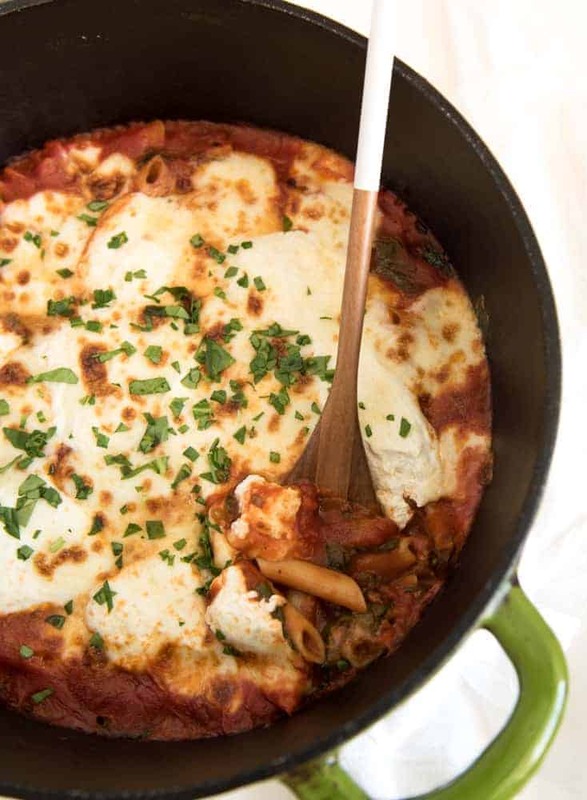 Dollop the surface of the pasta evenly with the ricotta and then top with the remaining mozzarella and Parmesan. Broil the ziti until the cheese is bubbling and beginning to brown, 5 to 7 minutes. Remove from the oven and let the dish cool for 10 minutes. Sprinkle with remaining 2 tablespoons of basil and serve. Enjoy, from my kitchen to yours, and don’t forget to pick up your own copy of Cook’s Country One-Pan Wonders. It’s a book you’ll go back to again and again! Disclosure: The folks at America’s Test Kitchen sent me a copy of the cookbook to review. I was not paid to write this post or for my review. This looks too good! Who knew you could make so many different things in one pot! That Lemony linguine with shrimp and spinach sounds amazing! I cut(chiffinade?) spinach up so his eye balls think its basil. He has no clue what basil tastes like…bahahahahhaha. You get to play with some fun cookbooks! 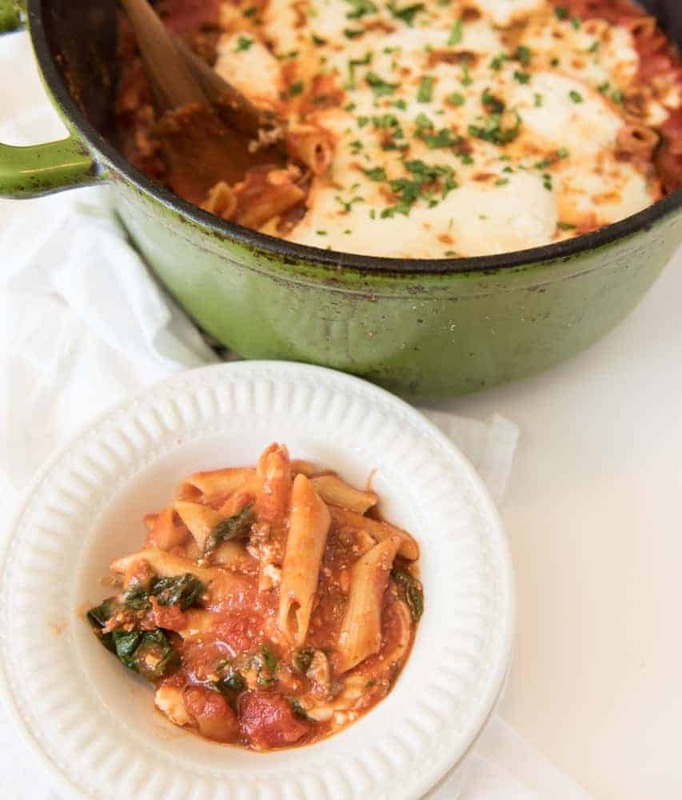 Someday I will have to make Ziti…..it has a cool name! Tomorrow i made this dish in my house party. Yummy it so cheese Me any My friend really enjoy it. After eat it they said ” please Andy send me this dish recipe”. Italian sausage are hero in this recipe. And another winning recipe! No ziti = NO PROBLEM…… Just used the rotini I had.. No fresh basil = NO PROBLEM…. I used dried basil. Still yummy. No ricotta cheese = NO PROBLEM. I used more mozzarella and parmesan. It came out DELICIOUS and was a breeze to clean up! LOVE this comment! 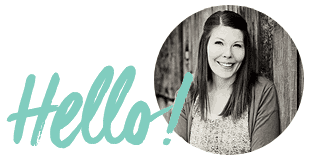 I feel like you are totally what makes blogging/cooking fun, let’s get together and make this sometime mmmkay! I made this for dinner tonight and it is really delicious – thank you! Thank YOU for a kind review, that made my night. We love that meal! Hi,I log on to your blogs named “The Best One Pot Baked Ziti — Bless this mess” daily.Your writing style is witty, keep it up! And you can look our website about love spell. Hoooray! I hope you make it, it’s a good one!